Begin by printing Frazer's Chart of Accounts. 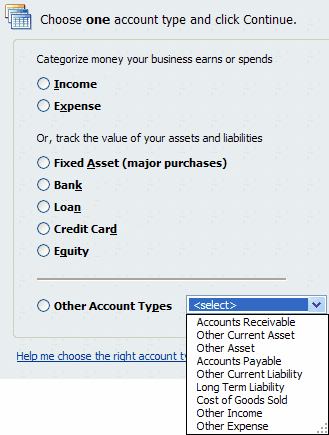 Go to Accounting >> 3 - Chart of Accounts and click . A print preview of the accounts will appear and can then be printed. To see a list of General Ledger accounts in Frazer, click here. Open the Company File in QuickBooks. Then Back up the QuickBooks data (File>>Create Backup). Using the printed list from Frazer, create a similar chart of accounts in QuickBooks, if one does not already exist. Click on OR type Ctrl + A. 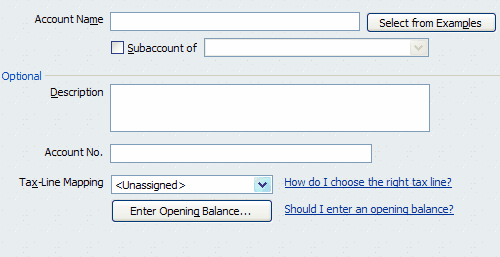 In the Chart of Accounts window, click on the Account button and choose New OR type Ctrl + N to create a new account. In the Add New Account window, select an Account Type. Because a one-to-one relationship will be created between the two Chart of Accounts, the Frazer Chart of Accounts and the QuickBooks Chart of Accounts MUST have matching account types. **Very Important Note** FrazerImport.IIF file does not include customer or vendor information, the Accounts Receivable and Accounts Payable in Frazer must be linked to Other Current Asset and Other Current Liability respectively in QuickBooks to avoid errors during the transfer. Enter the requested information into the New Account window. Enter the name of the account as it appears in Frazer's Chart of Accounts, as well as a description or account number if desired. Save the new account. Create new accounts until the QuickBooks Chart of Accounts matches Frazer's Chart of Accounts.